We all know and love the Total Gym. The versatility, the efficiency, and the great full-body workouts are just a few examples. It’s truly a “one stop shop” for all your fitness needs. As effective as the Total Gym is, sadly, we cannot fit it into our suitcase when we travel. Sometimes we won’t always have access to our favorite pieces of equipment. That being said, this doesn’t mean we can’t get a great workout in when while on the road. 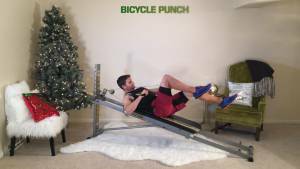 We can use a number of our favorite Total Gym-inspired exercises… just with a different tool for the job. Along with traditional bodyweight-only exercises, bands are a great option when traveling. Portable, inexpensive and easy-to-use, they’ll fit right into your suitcase. Bands – Bands, such as Superbands, are one long continuous piece of rubber. The different thicknesses will dictate the resistance (thicker band = more resistance). Tubing – There are also fitness tubing options that have handles on the ends. 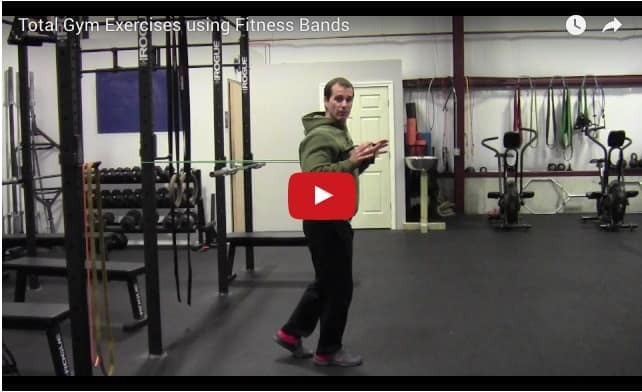 The movements shown in the video can be done with either bands or tubing so choose the one that you prefer. We want to get a full-body workout in that includes many foundational movements that we do in our everyday lives – pushing, pulling, lunging, and rotating. This “functional” routine will not only help build strength and burn fat, but will help with injury prevention as well. For this routine, you are going to complete the four movements listed below in a ‘circuit-style’ fashion. Complete movement #1, then #2, then #3, and finish with the last movement. Once you complete all four exercises, you will rest for 60-90 seconds. Continue this 4-movement circuit with 60 seconds of rest between rounds. This will keep your heart rate elevated, help with caloric burn, and keep your session effective and efficient.